Sukhoronjon Bali was initially a witness for prosecution who went missing for a while. Later on the defense team brought him to the court as their witness. According to them Bali was abducted by the police when he was about to enter. David Bergman, a British journalist based in Bangladesh, has been devotedly reporting the detailed proceedings of the ICT for quite a long time, including on the issue of alleged Bali abduction. While going through his writings I have found some of his statements and claims questionable. The article of our interest is one of them. At the beginning Bergman made it very clear that his sources were the defense lawyers and two journalists who work for the Jamaat’s mouthpiece in print media, The Daily Sangram. Let me ask my readers at this point whether I should rely on the account of these people who are in no way can be considered as the poster boys of integrity. This argument will be made clearer as we proceed. I think the most important statement of this article is the fourth paragraph. Just to point out that this statement is not the most important part of the Bali abduction case. The only important thing now to me and his family is Bali’s safe return. I don’t care whether Bali is going to vouch for the prosecution or the defense. A person, no matter who he is, cannot remain missing forever. It is his family who is suffering the most. If there is a credible allegation that he was abducted by the detective branch, the defense lawyer should take necessary measure to file report on the missing person so that the police actively search for him. Returning to my point, for this article let me quote the most important part here. Although there remains at present no entirely independent witness to this abduction, this allegation is credible in light of the background circumstances to this incident, the detailed corroborating accounts provided, and the photographs taken of the police vehicle in which the Bali is said to have been taken. Here, we see that based on the statements presented and facts observed David Bergman is trying to arrive at the decision that the allegation of abduction was credible. We will discuss whether Bergman has missed anything and if the misses are affordable. The article discusses how Bali became involved with the case and mention that the prosecution applied before the tribunal to accept Bali’s statement as evidence to the investigation officer when he went missing. I would like to draw your attention to the fifth paragraph of the ‘Prosecution witness’ section. For your ease, please allow me to quote it here. So with this (subtle punch?) Bergman hints that what the tribunal was requested to do is very unusual and might almost be unique. I am curious to know whether he was trying to mean that even if a witness is missing, in general the courts in Bangladesh still expect him to be present during the hearing! I hope not. Because that’s is whole point of missing! A person cannot be present at a place or point of time if he is missing. The court is supposed to take this millennium old definition of ‘missing’ into consideration and proceed forward. Let us come out of our nice comfort zone of ignorance and verify this claim. I invite you to review the THE EVIDENCE ACT, 1872 of Bangladesh. Through out the act, it was suggested in about nine places what the court should do in case a person is not found. In every case that was tried on this soil since 1872, this was the act used to deal with the situation when a witness went missing. Let me quote section 33 for my readers’ special attention. So, it is clear that the prosecution can lawfully request the court to consider the statement of a witness to the investigation team or the prosecution as evidence if he fails to appear at the court for subsequent oral testimonial. At this point I would like to encourage my readers to ask the question whether this evidence will be as strong as the statements produced and later cross-examined by the witness who were able to appear at the court. My naive answer is of course not. Let me quote from the conversation between the court and the prosecution which was not considered in the argument made by Bergman in our article of interest. Haider Ali: My lord, it will be considered as weak evidence. And Sukho Ronjon Bali has disappeared for the last 4 months. A GD was filed in local Police Station. It looks the prosecution and the court also agree with us that the evidence was going to be a weaker evidence. So, we all are on a pretty rational standing. The million dollar question is why on the earth Bergman mentioned that something unusual was about to happen? He is going to be asked this question as soon as this article is finished. It will be rational to ask why Bergman didn’t mention it to his readers that generally in Bangladesh an investigation officer is a police officer who belongs to the executive branch of the government. But by the ICT Act 1973, the investigation officer for Bali was from the judiciary which is Independent of the executive branch. I apologize to my readers for quoting again from the evidence act. This time it is from section 25. So, yes, the court doesn’t consider statements made to the police as evidences. But how can the argument be valid for the investigation officers of the ICT while they are not directed by the police department and also don’t have access to the infrastructure of interrogation of the police department? Let us proceed to the section ‘From prosecution to defence Witness’. Let me quote from the third paragraph of the section. On 21 October, the defense filed an application asking the tribunal to issue a summons requiring Bali to come to the tribunal as a defense witness. Bali’s family had filed a general diary in the police station in the last week of February that he was missing. This was subsequently reported to the ICT. Why did Bergman fail to ask the question that while his family was living in uncertainty about missing Bali for about four months why the defense started grooming him as soon as he was found for witnessing without prior reporting to the police or the family or the ICT? I am perfectly fine if Bali decides not to cooperate with the prosecution and take the side of the defense. But a person is reported to the police missing! Isn’t it unusual that whenever you first knew about his whereabouts you start working on your own agenda instead of notifying the police or his family? Doesn’t this need more scrutiny? Do we see that in this article? The last paragraph of the section is also interesting to me. It describes about how the date for Bali’s testimonial was fixed. In this article Bergman decides on the credibility of the allegation considering the statements of the defense lawyers. These are the same lawyers who took the pass for the day before the hearing date in the name of Atis Sen and later claimed to Bergman (mentioned in another post but ignored in the arguments made in this article) that they wanted to take Bali using Atis Sen’s pass. My dear readers, do you find this practice usual? Moreover, given this act of dishonesty by the lawyers, do you find Bergman’s interest to rely on their accounts usual? Let us go to the section ‘The next day: the abduction’. Here Bergman gives the detailed accounts of what happened on that day as reported by his sources. He quoted the Jamaat lawyer who, by the way, was the collector of pass in fake names on the previous day. The fourth and fifth paragraphs amused me like a standard Chuck Norris lore. So, in broad day light, while the abduction drama was going on, the first two journalists who were incidentally appeared one after another at the spot were both from the Jamaat mouthpiece in the media, The Daily Sangram! I would like to present some supplementary information for those who are not aware of the circulation of the Daily Sangram. 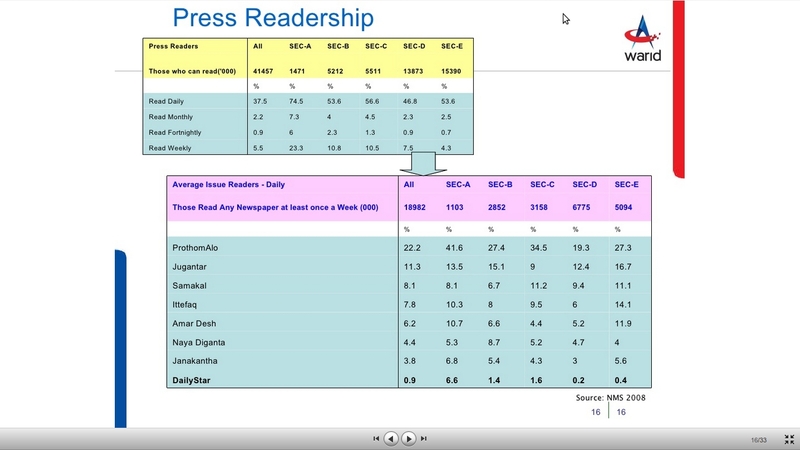 Thisgovernment report shows that the circulation of the Daily Sangram is among the worst. Being an avid follower of the Bangladesh media this is not a surprise to me but could be to some of the readers of the Bergman blog. Here is a screenshot of the list. Please look for the Daily Sangram at about the bottom. A little old circulation information of the Daily Sangram. If you are not a big fan of government survey here is another report by a private market research company which shows that the Daily Sangram is never considered as a player in private sector PR campaign. Let me include a screenshot of the figures. The Daily Sangram has no place in private sector marketing campaign strategy. So, going back to the original point, these are the people, taking fake pass from the courts and working for a newspaper with an ultra poor readership, who gives ‘credible’ accounts of Bali abduction to Bergman. The final circus of the article is the photographs. 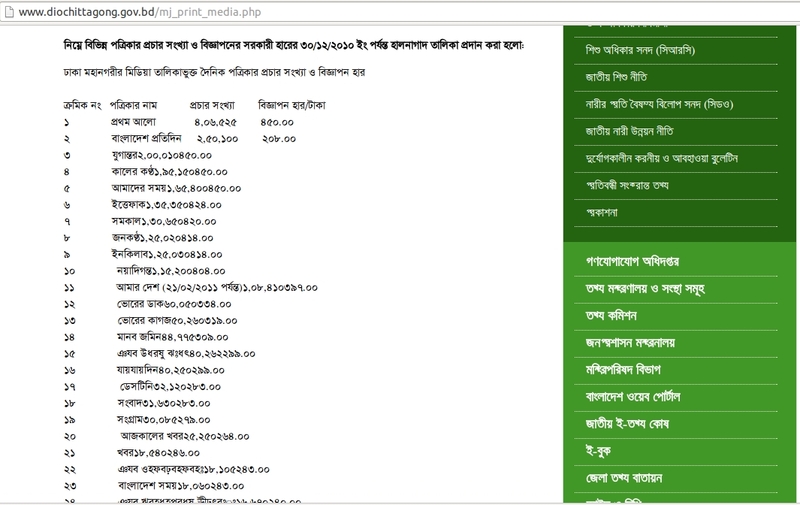 Bergman quoted Shahidul Islam’s account, another Sangram reporter(! ), that he saw the incident and had some exchanges while in the picture he was still wearing helmets and the police vehicle had already been leaving. Bergman also found the allegation credible based on the second picture with a white figure inside the car that he took to be Bali. 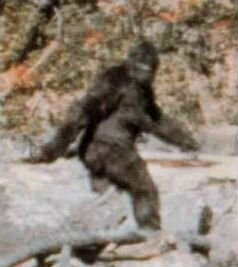 Isn’t the following picture of Bigfoot clearer? The ‘Credibility of the allegation’ section lacks seriously in mentioning Sangram’s amazing track record as a newspaper, the coincidence of appearing two Sangram reporters and no reporter from any other house at that moment, the fake pass the defense collected for Bali, not reporting to the police or court that missing Bali was found etc. I wish I could follow the thought process of arriving at a decision about the credibility given all these missing points included in that section. It is not always possible for a reporter to estimate the impact of the article s/he is writing. So, trying to justify the statements as much as possible with facts and rationale might be the best practice just like we always try to document the code of a computer program as much as possible. I thank David Bergman for taking interest in Bangladesh. As I have said this is a live commentary on the press covering the ICT of Bangladesh, I am going to send my issues to the authors of this article. I will keep you posted in the comment section whether they agreed with me or not.